In a previous blog in June , I described the August 21, 2017 eclipse and what to expect from it, along with the many resources available at the NASA website that fill-in the details of this event as we were expecting it to unfold. This website, by the way, went crazy for the eclipse and got over 2 billion hits from tens of millions of daily visitors. For myself, I was not prepared for the surge of emotions I would feel even after glimpsing only 15 seconds of this event between gaps in the clouds over Carbondale, Illinois. Why Carbondale? I described in a 2014 Huffington Post article how this would be the place where the eclipse lasted the longest, 2 minutes and 40 seconds, and so this is where NASA Edge decided to park us for our major public outreach activities and NASA TV interviews. I had been interviewed by a number of TV and radio reporters as well as a memorable Facebook interview with Curiosity. My article at NASA on the airline flights that would see the eclipse got quite a bit of traction. It was fun to see my articles on smartphone eclipse photography get so much press like this one at BuzzFeed, or this one at WIRED. I even presented my smartphone tips to 1000 students at a local high school, which was carried by the local TV station WSIL-TV. Amazingly, despite my public ‘expertise’ on the matter, I did not bother using my smartphone at all in the brief time that the eclipse showed itself! I mentioned in an interview with Carolyn Cerda also on WSIL-TV how I had brought along my cameras and hoped to grab just one image of this event. This was after many weeks of debating with myself whether I should even bother with photography at all. I knew how easy it was to get lost among the f/stops and exposure speeds in pursuit of a trophy to commemorate this event. I certainly didn’t want to waste precious time wrestling with the very finicky smartphone telephoto lens set up. But I also wanted to spend as much time as possible letting the emotions wash over me, just as they had done for millions of other people down through the thousands of years of human history. Could I, too, experience the fear that had so commonly been the popular experience? Or would my science protect me from these irrational feelings like some coat-of-armor? I had no idea, and in many of my TV interviews I said as much. I would run my digital, Sony camcorder during totality, and on the same tripod bracket, I would set my Nikon D3000 to a fixed f/stop and exposure speed selected to highlight the dazzling bright inner corona and any prominences or blood-red chromospheric light that may be present. 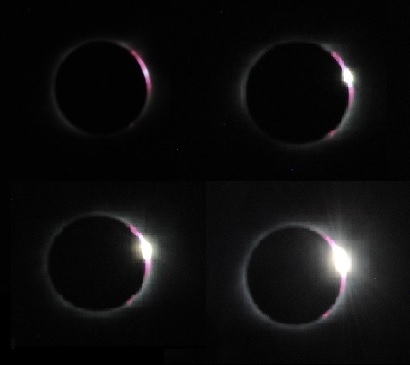 I would hold the shutter release down so that the camera took bursts of a dozen photos, and periodically snap photos at mid-eclipse, and on each side of the 2.5-minute window to catch Baily’s Beads and anything else going on. It sounded like a good plan, and one in which I could still spend all of my eyeball time looking at totality and not at my camera! This turned out to be a very good choice! The clouds did roll in and cover the entire eclipse except for the last 15 seconds of totality. 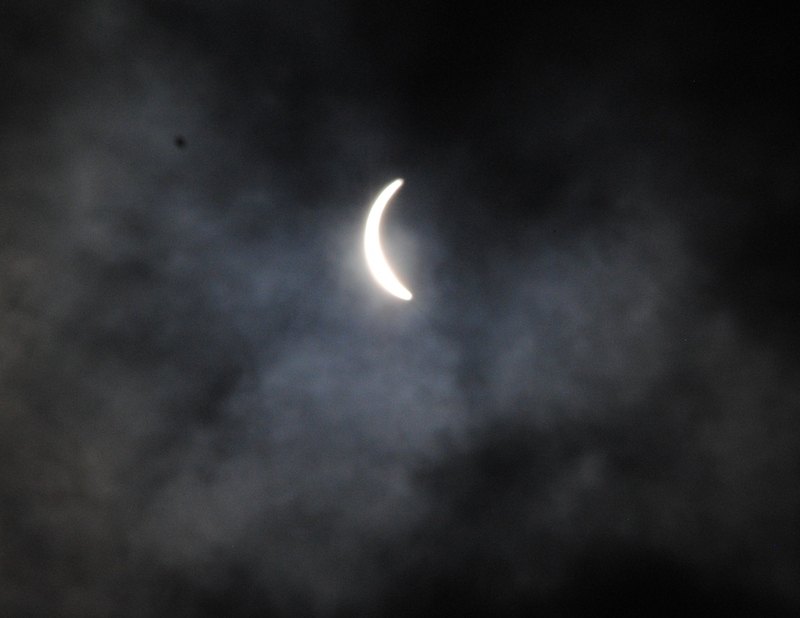 I snapped a few pictures like the one above using the clouds themselves to filter the intense sunlight, revealing a diminishing crescent sun. Had my NASA activities allowed us to be located a mile east rather than by Saluki Stadium at the Southern Illinois University, Carbondale campus, I would have been treated to a full 2.5 minutes of eclipse. But 15 seconds was just enough time to send chills down my spine and have the experience of a lifetime. My photos turned out not to be too bad. The montage below was posted on my Facebook page within an hour or so, and although a bit fuzzy for the clouds, it was clear I had seen the entire circumferential inner corona, several red spots along the solar limb as the chromosphere peaked through, and the delightful Diamond Ring of sunlight streaking through a deep lunar canyon! My camcorder also showed the emergence of the sun from totality, capturing the dense clouds and the screams from the thousands of people looking on. This also went up on my Facebook page to the delight of dozens of my friends and family! It was frustrating to see the crescent sun dip in to the dense clouds at the start of totality, and to watch the clock tick out the next few minutes, but as we reached mid-eclipse the scenery around me turned to twilight so quickly that I actually gasped in amazement! Hopefully, and with cameras at the ready I waited and then suddenly the brightening of a small portion of the cloud heralded that the eclipsed sun was about to make its appearance. When it did, everyone shouted and I watched with amazement, not really understanding what it was I was seeing. I immediately placed my finger on the shutter button, let the camera’s machinery take a series of 100 images, and hoped for the best. Again I was not dissappointed. A dark object appeared surrounded by an intense ring of light. I thought this was just the reflection of sunlight on the cloud, but in an instant I realized this was no sun glint for there was no brilliant solar disk to illuminate it. Instead, it was the corona itself, brighter to the naked eye than I ever could have imagined! Within a few seconds the moon began to move off the western edge of the solar disk and slowly but steadily a single bright point of light appeared and grew in brightness until I could no longer stare at it with my eye through the digital display of my camcorder. There was so much noise and ruckus from everyone else cheering that it was hard for me to collect and reflect on my thoughts – a process that took several days and repeated sharing of my experiences with family and friends. I had only experienced the ‘tip of an iceberg’ in the emotions that had hit me, and some were no doubt muted by the confusion of what I was seeing so briefly. I could only imagine what the full two minutes would have brought to mind. I was not prepared for the days to follow. My sense of loss was something ineffable that I could not quite shake. I drifted from day to day, occasionally gawking at the many gorgeous online photos taken by more savvy photographers and old-hands at totalities. 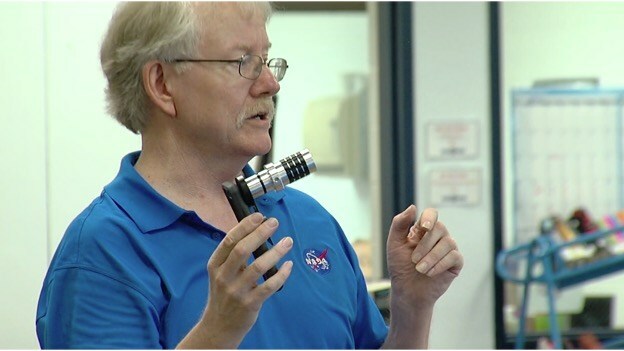 But you have to start somewhere, and at least for the first time in my life as an astronomer I can describe to my students,not only why we have eclipses and how our ancestors regarded them, but as with the Northern Lights, I can now add my own tiny voice to describing them in purely human terms!